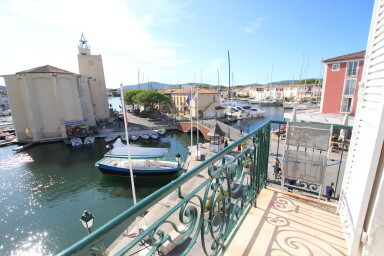 Spacious double-oriented apartment in the center of Port Grimaud. As a corner apartment located on the top floor, it has wonderful views on the canal and the Church. It is composed of a living-room, dining-room, a kitchen, 3 bedrooms, a large shower-room and separate toilets. Outside, a South-oriented balcony to have lunch whil enjoying the astonishing view. A 7m x 3m mooring. A very nice apartment close all facilities!